Ford Philippines recently announced their renewed year-long partnership with the Ford Forza Triathlon team during the Ford Forza 2016 Refuel, an event celebrating the team’s accomplishments in 2015 and introducing new members adding to the diverse roster of talented athletes at B Hotel in Quezon City. Led by team captain and businessman Gianluca Guidicelli, the Ford Forza Triathlon Team is comprises of 15 skilled triathletes including; celebrity Matteo Guidicelli, degreed nutritionist Giorgia Guidicelli, student Paolo Guidicelli, Saddle Row Instructor Claudia Tagle, professional race car driver Stefano Marcelo, actor Ivan Carapiet, media personalities Dyan Castillejo and Victor Basa, Atty. Joey Reyes, professional coach Elmo Clarabal, and businessman Jomer Lim. This 2016, they welcome three new members to their powerhouse lineup, pro-athletes Maria Hodges, Joseph Miller and Glenn Gonzalez. “We are extremely proud of our partnership with the Ford Forza Triathlon team and honored to share this journey with them. The team has been training hard and was recognized with multiple team wins and accomplishments in 2015, proving how they are Built Ford Tough. This 2016, Team Ford Forza is refueled to do more, achieve more and inspire more,” said Minnie Valencia-Bustamante, vice president of marketing and sales, Ford Philippines. Through the partnership, Ford will continue to help mobilize the Ford Forza Triathlon team with its class-leading vehicle offerings that match and complement their various personalities and lifestyles. Team Ford Forza has been recognized globally for their world-class competitiveness. In the past year alone, Gianluca, Jomer, Giorgia, Matteo and Ivan earned the prestigious title of IronMan Silver All World Athlete, which rewards the top five percent triathletes of their respective age groups for their hard work, dedication and performance in IronMan and IronMan 70.3 racing. Other notable 2015 highlights include Gianluca and Jomer’s finishes at the IronMan Taiwan and IronMan Arizona, together with new member Glenn Gonzalez, which is one of the most prestigious IM Races in the world; Dyan and Elmo’s 1st place finishes at the Safeguard 5i50 race Bohol and Giorgia’s 1st place finish at the Century Tuna 70.3 race Subic. “The year 2015 was the beginning of Ford Forza team’s amazing year of achievements. We were able to touch the lives of many people, including our sponsored athletes in the team. We continue to inspire through our dedication and commitment to our daily training and races. This 2016, we will work and race harder, tougher and happier. 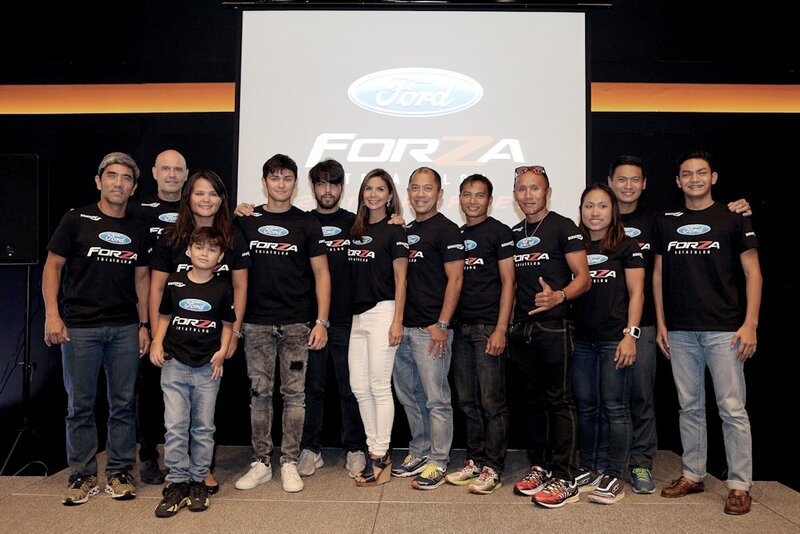 We are extremely proud of our members and their accomplishments, and together with our friends at Ford, we hope to continue promoting a healthy and fit lifestyle that will serve as an inspiration to all Filipinos,” said Gianluca Guidicelli, team captain of Ford Forza. Fueled by a winner’s mentality and a ‘Go Further’ attitude, the Ford Forza Triathlon team is geared up for another strong year as they look to do more in the triathlon circuit. Catch the Ford Forza Triathlon team in their upcoming competitions: Tri United 1 on February 28, IronMan 70.3 in Subic on March 6, Xterra New Zealand Championship on April 6, Xterra Asia-Pacific Championship in Australia on April 23, Xterra Malaysia and Xterra Asia-Pacific Tour Championship on May 7, Xterra Tahiti on May 14, Giro D’Luca in Bohol from May 20-22, 5150 Subic on June 5, IronMan 70.3 in Victoria Canada on June 12, IronMan 70.3 Asia Pacific Championship in Cebu on August 7, Mt. Mayon Triathlon on August 14, Xterra Japan on August 27, Xterra Korea on September 3, IronMan 70.3 World Championship on September 4, Maui Xterra World Championship on October 23, 5150 Bohol on November 6, and IronMan 70.3 Thailand on November 27.